Brighten up your Kitchen with Fun Red Kitchen Accessories. Here are some red kitchen ideas using red kitchen accessories. It is a well know designer trick to use small pops of an accent color when designing a living area. There can be no better color than red to choose. Red particularly looks fantastic when paired with white, cream or black. Red kitchen accessories come not only in solid colors, there is also a vast range of different designs and colors. From a cheerful and cheeky red polka dot to more elegant and sophisticated red and white stripes. Also, consider red floral patterns, tomatoes, chili peppers and red apple kitchen accessories. When choosing your red kitchen decor accessories, you need to be mindful of the shade and hue of red you select. It might seem strange but there is an almost unlimited range of different colored reds from a deep crimson to bright and lively chrome red. Be wary of placing reds together that have completely different tones as they can clash badly. 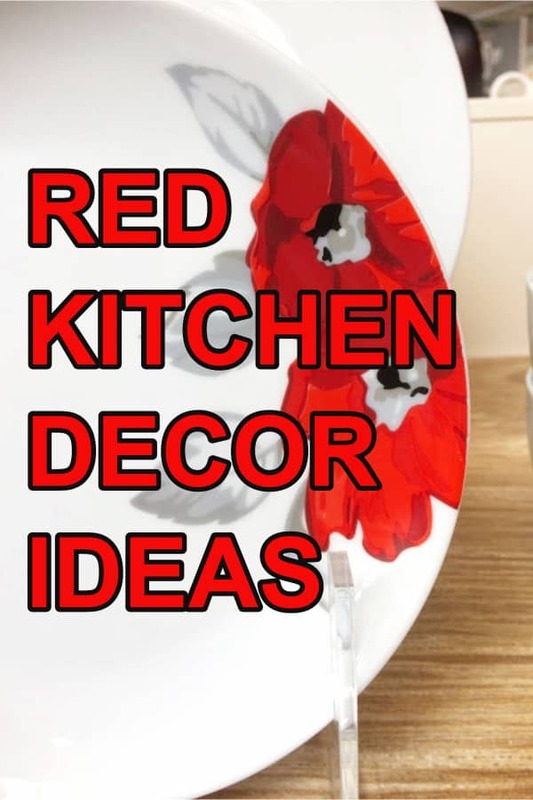 My Top 10 ideas for adding Red Kitchen Themes to your Kitchen, without breaking the budget. I laughed out loud when I first saw this knife set by Raffaele Iannello it’s a great joke. 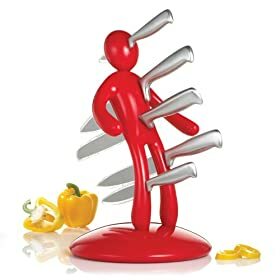 It makes those wooden knife blocks look rather tame… However, the set is practical as it holds 5 quality kitchen knives safely in plastic sheaves. The knives are included with the set. Red kitchen canisters offer a great way to add a splash of red to your kitchen decor. 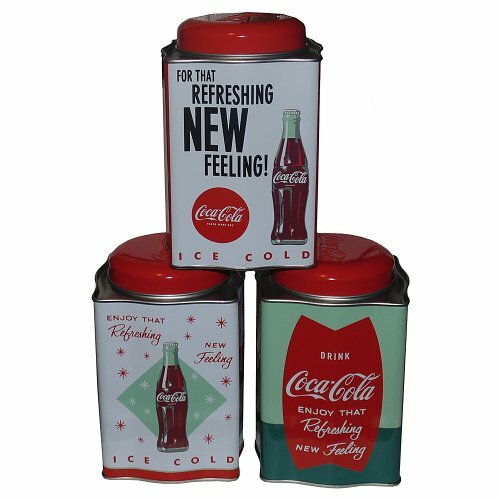 I love these fun coca cola canisters, the styling is retro with 3 different patterns. The artwork depicts pictures of old Coca-Cola advertising. These would make a great gift for a person that loves retro Cola-Cola advertising. I know there are many collectors of this type of memorabilia. Red Fruit Bowls can make a lovely statement piece in the kitchen. The fruit bowl I have featured here is of a stunning modern style. 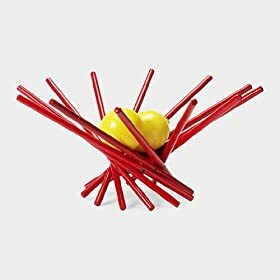 It is cleverly made by pinning together a set of wooden spokes that open out into a bowl shape. 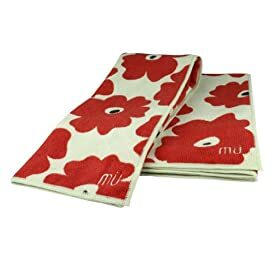 There is probably no cheaper and easier way to add color to your kitchen than buying red kitchen dishcloths. So I had to include these in my top ten. There are many different sets to buy with different patterns from solid colors to flower patterns, stripes or checks. These are a great choice if you have red and white kitchen decorating ideas. Every kitchen needs a kettle. Whether you prefer an electric model or a stove top model the look of the kettle is important as it is on display all the time. 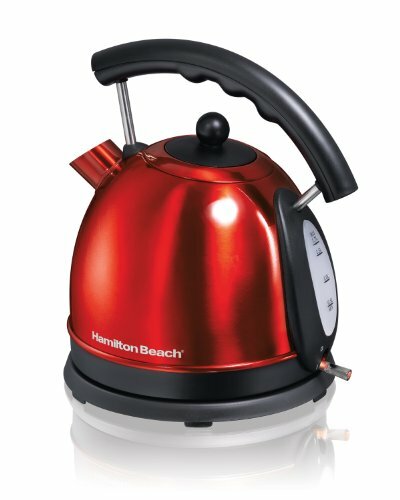 One of my favorites is this red dome electric tea kettle made by Hamilton Beach. It has an unusual but striking design and is sure to complement your kitchen decor. It is practical as well as you can heat up water for your tea or coffee very quickly. Another way to add some color and humor to your home is to buy an amusing doorstop. This is one of those that tickled me I love the idea of the wicked witch ending up stuck under my door, very funny. 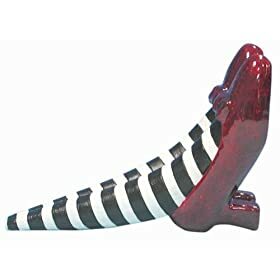 This doorstop would make a great present for a Wizard of Oz fan. Wow! this beats the usual wooden wine racks on the market. I love the way the wooden wine racks have an organic wavy motion. This is going to look fabulous on the counter-top of kitchen. 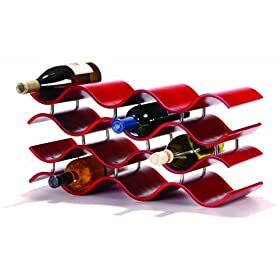 The design holds up to 12 wine bottles. 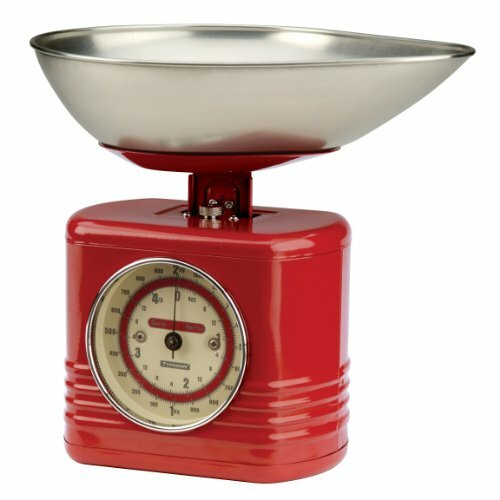 A cheerful set of retro mechanical kitchen scales sitting on your countertop is just the ideal item to bring some red into the kitchen. Kitchen scales are best when they can be left out on the countertop as are needed frequently when preparing and cooking meals. These scales are both good looking and practical. The large dial makes the weights easy to read. I like the way the weighing bowl has a kind of point at one end this makes tipping the ingredients that have been weighed easier to tip into a bowl. With some kitchen appliances, you just want to hide them in a cupboard when not in use. 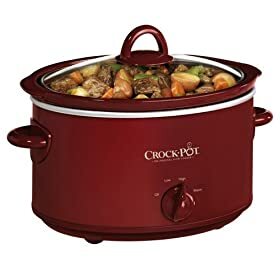 However with this red slow cooker by Crock Pot is attractive enough to leave out all the time. Another must have in the kitchen is a trivet. These will protect your counter-tops from damage from scorching hot pans etc from the stovetop or oven. 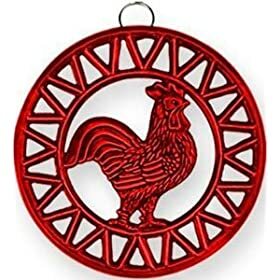 This rooster trivet is really pretty, it has a handy hanging hook so that you can display the trivet when not in use. Why Choose Red Kitchen Accessories? Red is a primary color, together with green and blue. Basically, a primary color is one that cannot be made by mixing other colors together. As colors are said to bring different emotional responses red is said to excite the emotions and stimulate the appetite, making red the ideal choice for your kitchen accent color. How to Effectively add Red Kitchen Accessories to your Kitchen Decor. The range of different red accessories you can buy is almost endless, tea towels, blenders, canisters, utensils, glassware and clocks are just some of the items that can be bought. Choose your red accessories well from the vast range available to enhance the design and feel of your kitchen. One time of year we associate with red is the holidays. For Christmas dinner choose red accessories, to bring in that holiday mood. the dining table always looks fabulous when it is dressed with a selection of red kitchen accessories. Choose from red placemats, side plates, flatware and glassware. Of course, it would be over the top if everything was red, temper the red down with other colors like, gold, green and white. In my personal opinion, the most desirable red kitchen accessories are those made by the company KitchenAid. They produce a wide range of accessories and appliances in red (they do other colors of course). They manufacture and sell toasters, blenders, mixers, utensils and much much more. They produce their accessories in an empire red which is a lovely deep red that has an almost retro feel.